LUVTruck.com • View topic - I need real advice about Hannah's rear diff. I need real advice about Hannah's rear diff. Post subject: I need real advice about Hannah's rear diff. I am now about 2 hours deep into searching for solid advice on what to do about the rear end in my truck. So far, I have found that Troopers and Rodeos might have the gears/axle width I am looking for depending on whatever year. Also, late 80's/early 90's Toyota pickups might have the same hardware that is worth it. You cannot PAY me to put Ford parts in my truck, so a 8.8" or a 9" is out of the question. Now, I am hoping, since it is 2017 and most of you have the correct information available, I can get some decent answers to my questions. 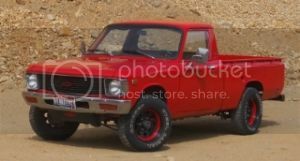 It is a 1979 4WD LUV with a 1.8L inline 4 GAS engine and 4 speed MANUAL transmission in it. It has been making a hell of a clanking sound similar to if someone had taken some bailing wire and wrapped it around the rear driveshaft and let it hit everything in sight. Unfortunately, that is not what happened. The pinion bearing is going bad and I believe it is about 40 miles away from grenading. This truck is my only vehicle to get around with, so I want to upgrade it to something strong and reliable. You guys are great, and have plenty of information, BUT every thread I enter contradicts the information in the last. SO what I am asking for is just some simple information so I can get my baby back on the road. I do not intend to upgrade transmission, engine, or front diff at this point. I am only looking for a relatively easy swap that has more parts available for my darling. Post subject: Re: I need real advice about Hannah's rear diff. I can't answer any other question.